School canteens are very important to the health of children and taking the main meal and can learn to eat more balanced. 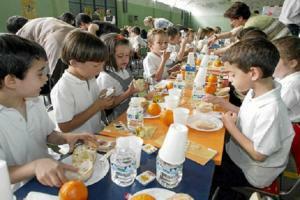 What should be the roles of the school canteen? Until they are those times in which all children are going to eat at home. People lived near the school and parents also ate at home. As often work away and now both work it is normal that the children stay in school canteens. The first, of course, is to feed those students. Sharing a meal with colleagues. It’s a more relaxed atmosphere and helps integrate best among them. Teach good habits related to food, wash your hands, use well covered, learn to share a common space, enjoy a varied and balanced diet, etc).. Adjusting to eating out, other cooked dishes or otherwise. Give time to do some extracurricular activity after eating so afternoons have more free time. Is it a guarantee that eat better? Have good work habits at the table must begin at home. In school canteens should reinforce these habits or correct any details. That’s like respect for the teacher, and at home should be educated to respect everyone. We can not ask teachers and trainers themselves do our work. More and more children going to school without taking anything there. Between that go late morning and parents are in a hurry the case is that many are fasting. All studies confirm that no facts “fuel” the brain is not operating at full capacity. Students are distracted and restless. Then at lunchtime will be as low glucose eat compulsively. After a binge, you will notice a drop and feel the need to nap. If there’s class performance will be disastrous. What you eat in school cafeterias? Until recently menus are basically organized to make them taste of the pupils. With the increase in childhood obesity and cholesterol was started a few years ago to control these menus. The doctor or nutritionist council was often undertaken to review the menus of school canteens in public schools. In private or subsidized schools is usually the company that manages the dining room. Adjust the diet at different ages. Drink water and do not get used to them with refreshments. Pay close attention to food issues (celiac disease, diabetes, food intolerances, etc..). Adapt the menu to the seasons. In winter more soups and hot foods. In summer more rice salads, pasta, legume, etc.. Light fare and give us less thirsty. Caring for the presentation and also eat by sight. Generally should not missing pulses as people just today the kitchen and, of course, vegetables and fruits. Fat, sugar and milk and they are generally all sobrados. Food grown by them: more and more schools and colleges that have their own school garden. They usually do it without chemicals. Apart from the quality of food is found that boys tend to be more receptive to trying new foods if they have cultivated. That are nearby: it is increasingly easy to contact farmers in the area. That leads to better prices, help the farmer a fair price copper and that the product is richer. Organic food: when you contact the farmer there are times that the price difference is tiny. Eating without much chemical is vital to try to pollute less Environment … and our body. Leverage remains: make compost for the school garden is relatively simple and we teach that everything can be exploited. To help make the menus: after studying the material in class can be very uplifting to help see what may need to eat a balanced and rich way. They can help in the kitchen at simple tasks and not dangerous: even once during the course can be very educational to help in any way, under adult supervision. want to help. Usually get the kids to expand their diet as they begin to experiment in the kitchen. To vary the dishes is a mode that will not get bored of eating the same thing and try new foods, even from other cultures. Learn to take care should be a compulsory subject. Feed correctly is a priceless good. At home and school canteens can be achieved with a little perseverance and imagination. Bon appetit!